Technology is great! And as the automotive industry moves more and more dealership marketing online, we have metrics for everything. But this can easily lead to analysis paralysis. What should you be tracking? What are the most valuable KPIs? It’s easy to get lost in the data. But here’s the bottom line: There are 5 simple questions that are the gold standard for measuring the success of your sales and marketing. Here are the questions you should be asking if you really want to know if you’re getting your money’s worth. 1. How many leads am I getting? You get leads in a lot of ways. They can be walk-ins, inbound calls or form submissions. Essentially, any time you can tie a person back to their name, email and phone number, it constitutes a lead. These leads are a huge asset for your business because it directly links you to people who are looking to buy NOW! And that’s why it’s incredibly important for you to know how many leads you’re getting and where they are coming from each month. With so much of the automotive retail business moving online, most of your leads are probably coming in the form of a web form submission. Now, obviously, not all leads are worth their weight in gold. We all know that some of the leads you get will be bogus and some of them will be duplicates, so ultimately what you want to know is how many unique, valid leads you received last month. We’ve found this number to be between 10-15% of the total leads received for most dealerships. But if you’re tracking your numbers routinely, you’ll be able to sniff out any irregularities. 2. How many of those leads am I connecting with? The next question you should be asking yourself if you want to measure the success of your sales and marketing is how many of these unique, valid leads you are actually able to connect with. What we’ve found is that, on average, if you’re approaching lead follow-up strategically, you can connect with 85% of your unique, valid leads. This is incredibly important because every lead that you aren’t able to connect with is a missed opportunity and potentially a missed sale. You’re looking for a connect rate of 85% or higher. We defined this as the target connect rate because we have clients in markets of all shapes and sizes that are achieving this on a regular basis. But most lead follow-up systems aren’t capable of managing call flow logic and lead priority scoring fast enough to achieve this target. Here’s the stark truth—the value of a lead drops like a rock as time passes after the lead has opted in. In fact, some studies have shown that a lead called in the first five minutes has a ten times greater chance of being reached than a lead called just one hour after being created. A one-day-old lead is nearly worthless compared to a five-minutes old lead. So in order to achieve the 85% target, you must tackle new leads with a strategy constructed around frequency and speed. 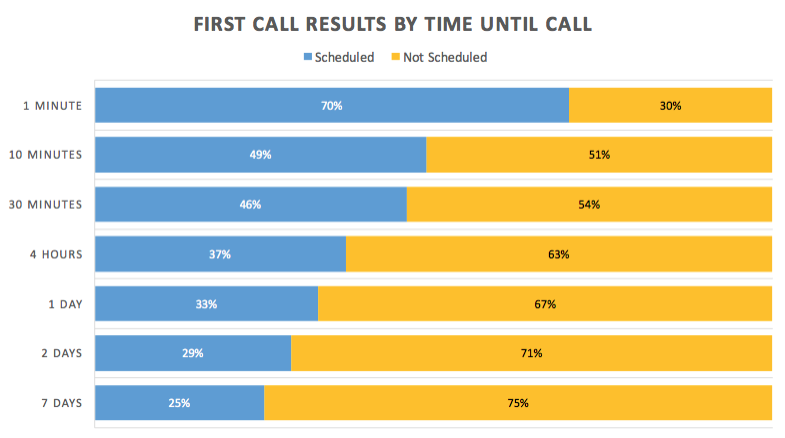 What we’ve found is that the cadence that is most effective in converting web leads to appointments has about 50 percent of the calls scheduled to occur in the first 48 hours, with the other half of the calls being spread out over the course of the month. But you don’t have to make up this cadence on your own. In fact, you can get access to a call cadence that regularly delivers these results here. 3. How many of the people my team speaks to are booking appointments? Achieving an 85% connect rate is only valuable if you’re able to convert a high number of those conversations into appointments. Knowing this number, what we call the schedule rate, is incredibly appointment in diagnosing problems and bottlenecks in your sales funnel. We’ve found that if the people handling your lead follow-up are asking the right questions and creating a real human-to-human connection with the person on the other end of the phone that you can convert 50% of your connects into appointments. So if you’re connecting with 500 people each month, you should be scheduling 250 appointments. 4. How many of those appointments are showing up? Again, this partially comes down to the conversations that are happening on the phone at the time that the appointment is booked. Many of the dealers we work with have experienced good success when they use manager or rep confirmations and offer incentives for people to show up for the appointment. But by and large, even if your reps are doing a great job on the phones, about half of the people you schedule are going to show up and half are not. So you can expect that about 50% of your appointments will no show. 5. How many of the appointments that show up are converting to sales? There’s a lot that goes into closing a sale once a customer makes it to the lot. And we won’t pretend to be experts on how you should run your sales process. Ultimately, you know at what rate your sales team can and should be performing. For conversation’s sake, we’ll tell you that the dealers we work with typically report a closing rate of somewhere between 15-30%, with most of them hovering right around the 25% mark. 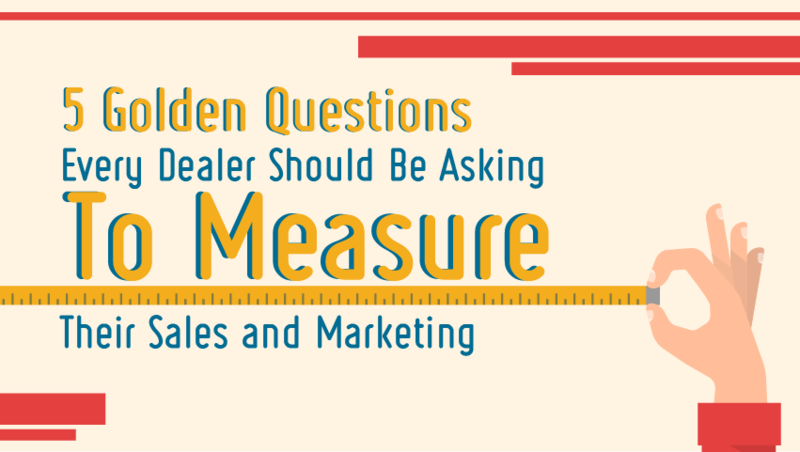 Ultimately, dealers who are able to track and measure these metrics are hugely successful. In fact, dealers we’ve worked with who are in tune with these numbers have easily doubled their business in as little as 90 days. But the biggest problems for most dealers is that this information is hard to get and even harder to verify due to broken reporting mechanisms and feedback loops. Most of our clients use an easy tool that tracks all of these metrics, like Call CommandoSM. Call CommandoSM simplifies the process of lead follow-up by increasing output and the quality and quantity of connections you build with past, present and future customers. Not only does Call CommandoSM serve up the perfect lead at the perfect time, but it also generates valuable reports for you to track these key metrics. It even automatically generates a funnel report for you. This is a screenshot of a dealership’s funnel report from Call CommandoSM. For the purposes of this report, we’re viewing a 30-day time period that started 60 days ago. This allows ample time for leads to work their way all the way through the sales funnel, allowing you to detect bottlenecks in your sales process. Here’s how it works. When you examine your funnel report within Call CommandoSM, you can see that the dealership received 3,428 leads during this time period. Of those leads, 2,472 were unique, valid leads, which is important to know in order to accurately track the ROI of your marketing dollars. There is another report within Call CommandoSM that allows you to analyze which of your lead sources is generating the most ROI. If we continue down the funnel, you’ll see that the connect rate is hovering close to the recommended target of 85%. However, the scheduled rate is sitting a bit low at only 43%, down 7% from the target. This is a good signal that you need to spend some time looking into your BDC. Perhaps your reps need some additional coaching on how to take connects all the way through to a booked appointment. But they are delivering an above average show rate and the closing rate seems on target. This demonstrates how valuable asking these 5 golden questions can be. You can learn more about Call CommandoSM here. But even if you aren’t using Call CommandoSM, you should still be examining these numbers because the opportunity is HUGE. To put it in perspective, if at any point in your process you have a major bottleneck or breakdown, you could be missing out on a ton of additional sales and profit. Think about it. If you are only connecting with 65% of your leads instead of 85%, that’s achieving 75% of the target. So if you’re currently selling 100 cars that means that there is an additional 25% left on the table. That’s AN EXTRA 25 CARS SOLD from leads you’re already paying for. Just think about what you could do if your dealership started selling 25 extra cars tomorrow. Imagine knowing you’re taking full advantage of the opportunity in your market—having the data from asking these 5 golden questions is invaluable!